Pier A Harbor House is a historic 19th-century waterfront building that was restored in 2009 to become a food and drink hub. Situated on the Hudson River with a slightly obscured view of the Statue of Liberty, Pier A is home to several bars that co-exist separately in the space. BlackTail, conceived by the same team as the nearby Dead Rabbit, is the most upscale and destination-worthy of these. 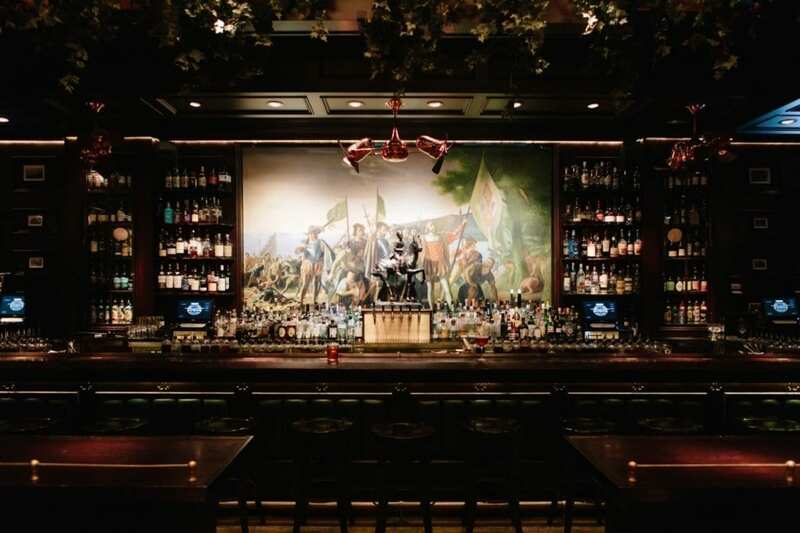 Adjacent to the Financial District and the tourist-centric Statue of Liberty cruise, BlackTail often packs in a mix of after-work drinkers and tourists. Groups vary from lively families to more casual coworkers in need of some relaxation. To enter, guests must climb a dramatic wooden staircase and be escorted to a table or the bar, where ice in cocktail shakers mimics the Latin beats playing over the stereo. Menus are presented as Hemmingway-esque books, with chapters broken up between highballs, punches, sours and various renditions of the Old Fashioned. Cuban classics like the Mojito and Cuba Libre are, of course, on offer, but menu standouts are the tangy, complex punches, including a Piña Colada that doesn’t hold back on the rum or cream. Unlike New York’s many newfangled speakeasies, BlackTail is a bar that celebrates Prohibition in a different way – remembering the 1920s as a time when wealthy Americans travelled to Cuba for free-flowing booze. This nostalgia leaks into the fine details, such as a printed postcard tucked into each menu, sent anywhere in the world free of charge, for any guest who writes and addresses it. But traditional values don’t leave this bar stuck in the past – even riffs on the classics are modern and creative, mixing both familiar and unusual cocktail ingredients to play on beloved flavours. The values, too, are very twenty-first century: On a recent visit, a bartender (in a fedora, as they all are) chided a guest for calling a Daiquiri a “girly drink” – explaining that booze, beloved by all, does not have a gender.